The Bow Loom is an ancient technique using a simple, portable loom to make narrow, beaded bands. The technique is used by groups in northern Thailand to make bands for their exquisite headdresses. The weaving is quick and fun and oh so portable. No previous weaving experience is necessary. This is a great introduction to ethnic weaving. This class requires no previous crafting experience. It is suitable for any student age 10 to adult. The materials needed for this project are easily available in most craft stores, bead stores, or hardware stores. I use 'Pearle' cotton, glass beads, simple paperclips, various needles, duct tape, a dry sponge, a dowel, common glues, and if the project wants to be a bracelet, ribbon end caps and lobster clasp (or other closure method of your choice). 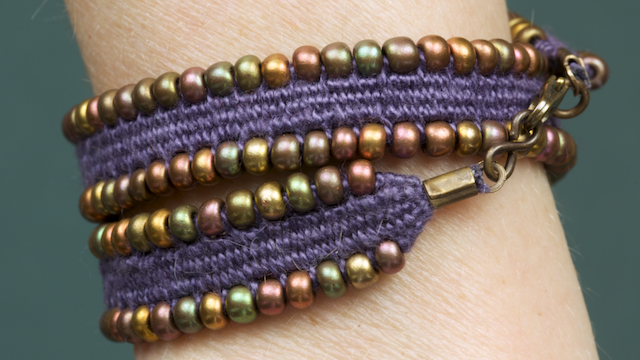 Placing findings on a bracelet will require 2 pair of jewelry pliers. Marilyn does a very good job with instruction, explaining every step in detail. Visuals were very good. Camera/video work was excellent. She even pointed common mistakes. ?? Thank you. I know I can teach a class like this to anyone. This is such a fun class! I have made so many of these now and have discovered I can vary my weave in so many different ways to create patterns and expose some of the weft and/or warp threads. I have made a couple bow looms for friends now as well so they can learn to make their own as quite a few have asked me to make them bracelets. I'm referring them here so they can learn it the proper way. Thanks so much for making an easily confused person like me understand how to do this. Thoroughly enjoyed! What a great class! Marilyn makes bow loom weaving a lot easier than it looks! We’ve made bow loom bookmarks and bracelets and are looking forward to seeing more videos on Taproot Video. It’s wonderful to feel connected to these fun cultural traditions from around the world. And her videos are appropriate for all ages and abilities. This is a fun class, and very approachable no matter your weaving experience. And you'll start interesting conversations if you take your bow loom out to the park to weave. Bow Loom Weaving is so fun, and Marilyn makes it easy to learn! I've made several bracelets as gifts, and the recipients were very impressed. These classes are excellent. Thanks so much!